One of the ways that we encourage participants in our Spirited Life program to focus on their wellness is by awarding them each a one-time grant of $500. Pastors are encouraged to use the grant to offset costs associated with their pursuit of the health goals. They’ve used their grants for everything from gym memberships to hobby supplies. Q. How long have you been in ministry? A. My first church appointment was in 1988 and last appointment was in 2011. Currently I am classified as local pastor. I am not in an appointment. Q. What did you do before you entered into ministry? A. I was a bi-vocational pastor for 25 years. I retired from the U.S. Postal System in 2009. I also founded a non-profit called Nia’s Ark that addresses health issues in the African American church. We have partnered with UNC Chapel Hill “Ethnic Minority Health Organization” on research projects in the faith community. We are currently planning prostate cancer workshops in the faith community for the fall of 2013. Q. What did you purchase with your small grant? 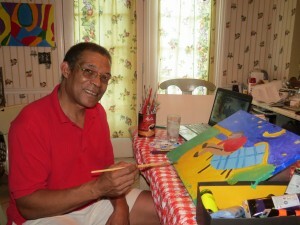 A. I used the grant to purchase art supplies and to pay membership fees for local artist guilds. I bought canvases and paints and brushes. Q. Are there other artists in your family tree? A. 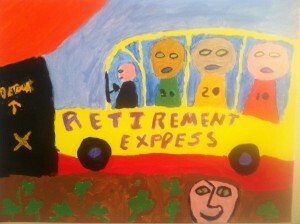 My son majored in art in college and plans to pursue a master of fine art degree. Q. What about art inspires you? What do you find relaxing about it? A. I have always enjoyed art. As a child I enjoyed creating art. My favorite art form was ceramics at summer camp. I began painting in February 2013 after looking at some photos of the stars from the Hubble telescope. I was attempting to capture the beauty of the universe through painting. I found that painting allowed me to channel my feelings onto canvas. I started to experiment with different styles of painting. I studied the styles of various artists. There was a practice period where I tried to duplicate others’ work. During this period I had to learn about what brushes to use and how to blend colors. I eventually started to be able to bring my own visions to bring to life on canvas. I paint what I feel on a given day. My inspiration comes from conversations with friends and life itself. There is still a lot I have to learn. Art is instrumental in helping to maintain my mental health. I started doing art when I was going before the Board of Ordained Ministry. 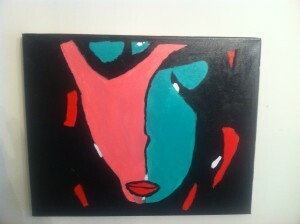 The outcome was not what I expected and art allowed me express what I was feeling. I did a painting called Jacob’s Ladder that came out that experience. When I started sharing my art with friends they were surprised because it was something new. I was commissioned to do a few pieces for a local business. My art is on display for purchase. Art allows me to tell a story on canvas. Q.What do you do with the art work when it’s completed? Sell it? Donate it? Keep it? A. When I complete my art I post it on the Fine Art America website. This is a great website as people from all over the world are viewing my art. I am trying to get art galleries to take them on consignment. Many thanks to Rev. Weatherford for sharing! When I joined the Clergy Health Initiative in early 2012, I was charged with coordinating the bi-annual health screenings that, in part, help pastors in Spirited Life track their personal progress in the program. Over time, I’ve come to see my role as helping to provide a “mirror” for Spirited Life pastors. Some of our pastors love the reflection they see when they come to a health screening… 20 pounds lost, blood pressure that’s come under control, a waist circumference that means it’s time to go shopping for smaller clothes. Other pastors, I’m certain, dread what they expect to see in the health screening mirror. Despite great intentions, too many desserts were consumed last month. Mornings once spent on the treadmill have fallen victim to busy schedules, and the numbers will be evidence of that. It’d be easier to skip the health screening this next round, to not have to look in that “mirror” and see the reflection that proves the digression. After all, ignorance is bliss, right? Not quite. You see, I know first-hand that ignorance of our health is anything but bliss. And I know this because I was once obese. Not heavy or just a tad overweight, but legitimately and clinically obese. I started early, initially gaining weight in high school, and despite running the gauntlet of several fad diets, continued to pile on weight in college. Upon graduation, I loaded up my car, left North Carolina and headed west to San Diego. As a young adult in an expensive city, I quickly took two jobs – one working in an HIV research center, and the other, serving specialty coffee drinks in a local café. My first year in San Diego often included 70-hour work weeks, often not having a day off for 30 days in a row. My schedule, and limited budget, made it difficult (in my mind) to eat healthy meals or make time for exercise, and so I piled on even more pounds. I told myself it was okay if I was overweight, because I was doing important work for society in my HIV research job. And I was kind, charitable, intelligent. That should be enough, right? It shouldn’t matter what I looked like on the outside, because I was a good person on the inside. And sure, there’s truth to that. But in focusing on superficial appearance with that approach, I was ignoring the part of my inside that was my health. And health does matter. Back then, my dad tried to be my first “mirror.” He’s a family physician, a two-time marathon finisher, a fit and healthy guy. When he looked at me, I knew he saw a good person, but he also saw my future reflected in many of his patients – a future that was likely to include heart disease or diabetes. But I ignored that part of my reflection in his eyes – the one of sadness over my poor health. I was even ignoring real mirrors in my apartment… no full-length mirrors hung on my walls back then. And what about pictures? Well, thanks to technology, I could quickly crop those to “shave” off my arm fat or eliminate my hips from view altogether. I spent extra time on my hair and makeup and focused on that part of my physical appearance, easily ignoring the rest. But then, there was the picture I couldn’t fix. My brother had come to visit and one particular photo featured us standing on a vista overlooking the ocean. There was no way to crop the picture without getting rid of all that beautiful background. That’s the day I finally, truly saw the reflection I’d been so actively avoiding. I was double the size of my brother. My posture was slumped, my eyes sad. I looked unhealthy. And when I plugged the numbers from my last doctor’s visit into a BMI calculator, the big block letters that popped up agreed. I was OBESE and officially at risk for all the things my dad so feared for me. This time, I didn’t jump on a fad diet. Little by little, I started changing my unhealthy ways and working to build healthier habits. Sugary lattes were traded for plain coffee with a bit of skim milk. Lunches eaten out were replaced with portion-controlled meals and an apple. And a few months later when my dad was diagnosed with early-stage prostate cancer, I decided to deal with my emotions on the pavement, and in his honor, became a runner. Nearly 8 years later, I’m 50 pounds lighter than I was back then. My blood pressure is low, my cholesterol levels are in check, and most days, I feel pretty darn good. But that victory has taken years to achieve, and more importantly, maintain. I’ve certainly struggled through my fair share of battles along the way. A knee injury sidelined my running career 6 months after it began. 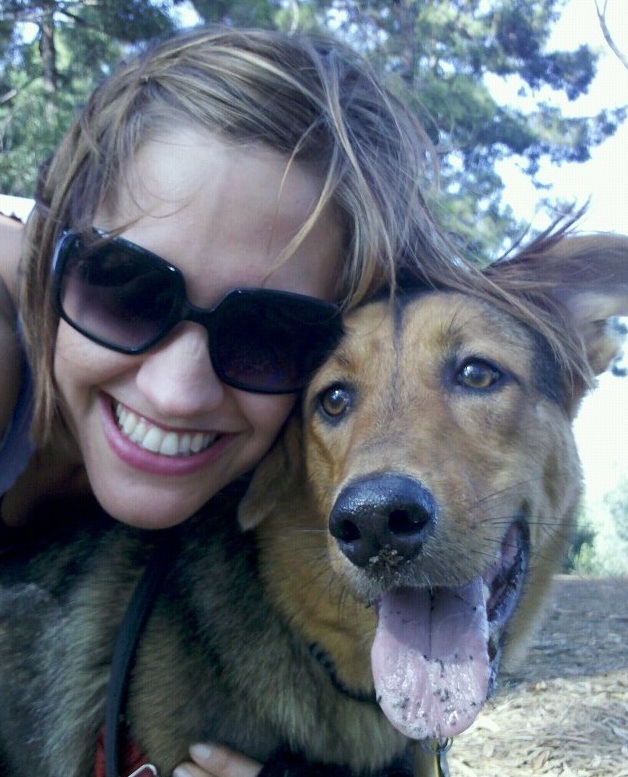 More recently, after having started running again, I temporarily lost my go-to running buddy when my dog was injured in an accident. And then there’s the demanding seasonal work schedule that comes with coordinating dozens of health screenings twice a year. It’s easy to get off track. But I’ve also learned, that it can be just as easy to get back on track if I keep mirrors around me. Sure, there’s the full-length one in my bedroom now hung in a place that can’t be avoided. But there are other “mirrors” I choose to see too. There’s the bathroom scale I step on each week. The self-awareness that I feel better when eating mostly fresh fruits and vegetables over processed foods. The joy that comes from seeing my recovered pup’s tongue dangling out of his mouth in exhaustion after a run. There’s a new picture I make sure to look at too and this one’s not cropped! It was taken while on vacation with friends in Europe a couple years ago. My face reflects pure happiness – and I’m literally jumping for joy in my new, lighter, healthier body. For those readers who are participating in Spirited Life, there’s a good chance that you’ve seen me at a screening, heard my voice on the phone, or received an email from me about attending your next screening. I wanted to share the story of my own weight loss and health maintenance journey so that you’d also know how much I really do celebrate your victories with you. And that I understand the hard work, time, and setbacks that are part of the journey toward better health. I used to look at thin people and think that being skinny and healthy was natural for them. I know now that, more than likely, they reflect upon and work on their health in their own ways each day, and they surely have their own challenges to contend with on their journey. I hope you’ll let us, the health screenings team, continue to be a mirror in your lives. And I hope that by sharing my story, you’ll take some time to find the metaphorical mirrors that might help you along your own path towards wellness. I first met the Rev. Laura Hayes Mitchell, pastor of Burgaw UMC in Burgaw, NC, at the 2011 Spirited Life winter workshop at Oak Island. While there, she shared with me that she had a vision of where she wanted to be with her health and what she wanted to do about it. So Laura set goals based on her vision. 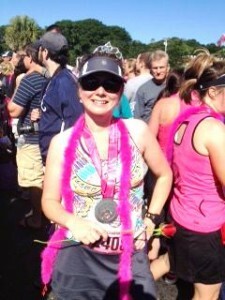 She made time for the gym, followed Naturally Slim, and began to think a 5K was within reach. She began to see that she needed to carve out the time regularly for herself. She noticed that she felt good and had more energy when she exercised. Then, it was time for the first race. “What a hoot!” Laura reported. She finished the race with a “respectable time,” but more importantly, she emerged with even more motivation for longer races. I found her last statement interesting, especially as I’m reading The Power of Habit by Charles Duhigg. Duhigg draws on research in experimental and applied psychology along with neurology, highlighting just how interesting — and powerful — the brain really is! Thanks, Laura, for inspiring us. It’s amazing how quickly habits can change! We’re excited to introduce our new Spirited Life video, featuring pastors Eldrick Davis, Alexis Coleman, and Bob Kretzu. Each of them was kind enough to let us spend a day with them and learn about their life in ministry and their experience in Spirited Life. Their stories vary widely — they’ve tackled grief, stress, questions of vocational call, and weight loss (as of last July, Eldrick had lost 101 pounds(! ), sustained in part by the support of his congregation.) Their stories are both real and representative of many we’ve heard throughout Spirited Life, and we’re thankful they were willing to share them so openly. Please share the video and help us spread the word about Spirited Life. Spirited Life participant Rev. 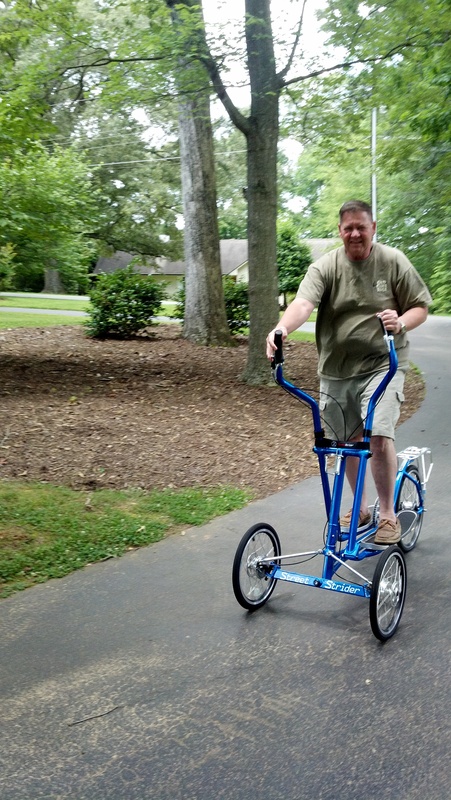 Tim Whittington started the Walking Ministry at Unity United Methodist Church in Kannapolis, N.C, in response to the benefits he has experienced from his participation in Spirited Life and more specifically, the healthy eating program Naturally Slim. 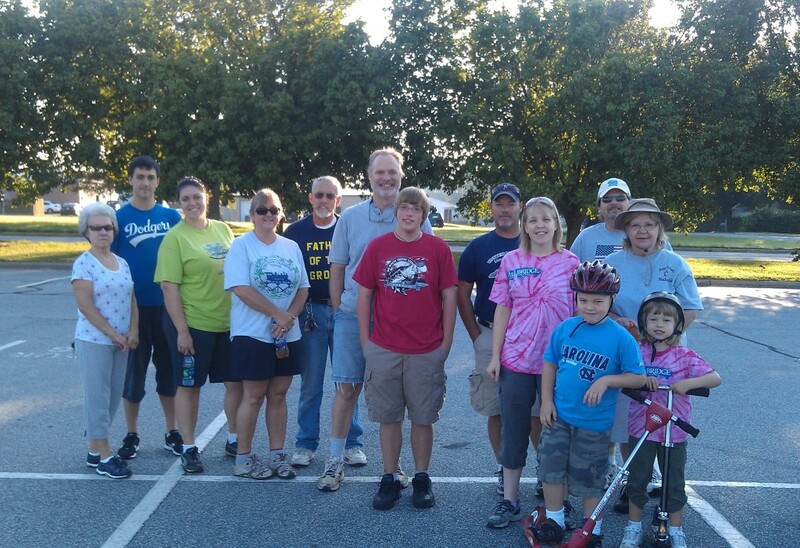 Church members meet at Food Lion in Mooresville each Saturday morning at eight and take a two-mile walk through town, exercising their bodies and spreading the word about their church. The group always opens with a prayer, and walkers are encouraged to go at their own pace. Pastor Tim attributes the success of the Walking Ministry to the fact that it provides motivation and fellowship for participants, and it’s a unique way for people to get out and exercise. They hope to eventually expand their walking to other days of the week as well. 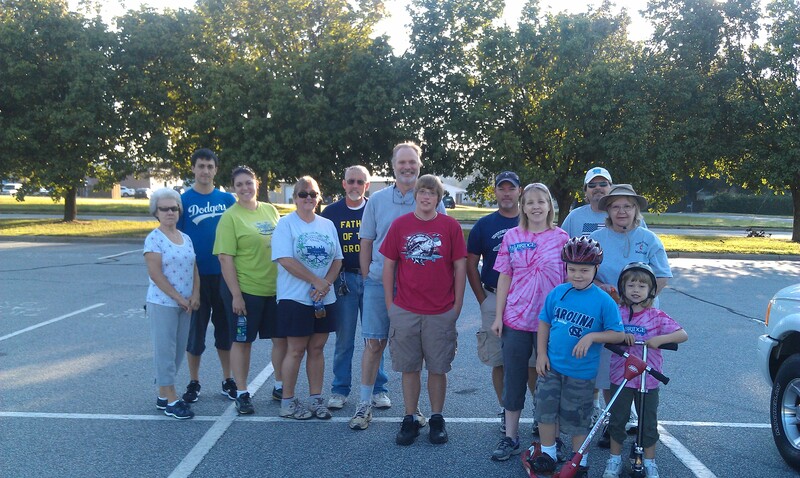 To Pastor Tim and the Unity UMC Walkers, keep up the great work, and thanks for being an inspiration to us all! In an interview with North Carolina Health News’ Rose Hoban, Rev. Lee Pittard shared his journey toward wellness as a participant in Spirited Life. Initially a skeptic, Lee signed up for Spirited Life because he thought it was expected of him. But “when I actually saw that I was making progress and having a different attitude, I thought, ‘changing things is possible,’” he said. One of Lee’s initial goals was to acknowledge his stress-eating patterns and form some new habits to help with weight loss. He also enlisted the help of a wellness advocate. “Having a Spirited Life coach email me and check up on my progress has been really useful. One thing I need is someone to hold me accountable for exercising,” he said. Lee began with walking as his main form of exercise; he now jogs 3-4 times each week. He chose running in part because it was an activity he could do with his son, who runs cross country for his high school. 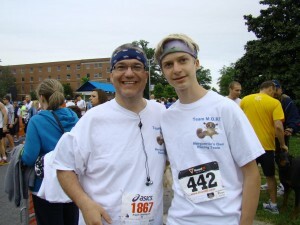 In April, Lee achieved one of his health goals when he completed a 5K race, beating the time he had set for himself. Read the full North Carolina Health News article here. Rev. Charles Lindquist, one of our Group 2 Spirited Life participants, has had great success using the mindful eating program Naturally Slim and creating his own exercise routine. Read on to hear more about Charles’ experience in his own words! “I started the Naturally Slim program on March 13, 2012. I found it to be jam-packed with great and useful information. So far I have lost 35 pounds and over 20 inches overall in body measurements. Because of Naturally Slim, I feel better and better every day. My clothes are all too big and I am choosing to purchase temporary replacements from Goodwill and other thrift stores until I get to my ideal weight and can purchase a new wardrobe. What a great problem to have! For exercise, I use my Total Gym (Chuck Norris and Christie Brinkley advertise this), which I have been using off and on for several years. 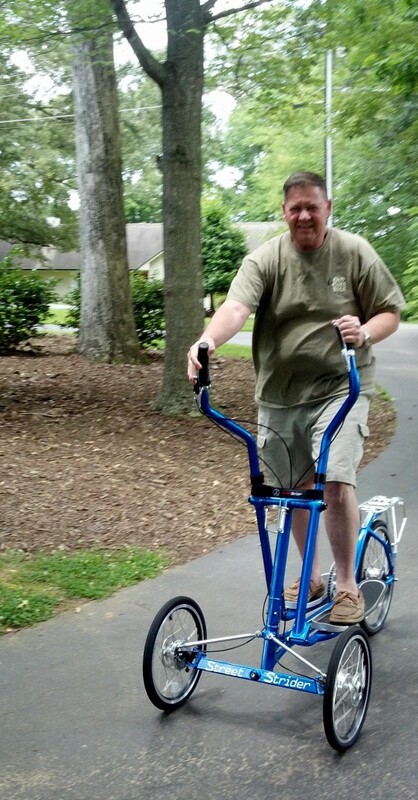 I have recently, within the last three weeks, incorporated a StreetStrider into my exercise routine. I choose to work out two short periods (20 minutes on StreetStrider and 15 minutes on Total Gym), once in the morning and once in the evening, rather than doing it in one long workout each day. I also try to play at least nine holes of golf a week, which is my way of relaxing and reducing stress. I love the StreetStrider because it actually makes working out fun. I have always loved the elliptical machine because of the cross training it provides; however, I find staying in one spot, staring at the wall or other people boring! The StreetStrider is the elliptical that moves with you. I usually ride mine about 6:00 am, a good time to view rabbits, deer, and other wildlife. Besides that, it truly works. Do you have a success story you want to share? Leave a note in the comment section below. We’d love to hear from you!